Impact of active and second hand tobacco smoke on CRS patients: comparative analysis by CT scanning and nasal endoscopy. Citation: Tyagi S, Tyagi BS. Impact of active and second hand tobacco smoke on CRS patients: comparative analysis by CT scanning and nasal endoscopy. Res J Allergy Immunol. 2017;1(1):14-16. Aim: To evaluate the association between active smoking, second hand tobacco smoke (SHS) exposure and chronic rhinosinusitis (CRS). Material and methodology: 100 cases with a confirmed diagnosis of CRS, were evaluated with anterior rhinoscopy, nasal endoscopy and plain radiography & CT scans of paranasal sinuses. A validated questionnaire was used to assess past and present active smoking and SHS. Results: CRS cases exposed to active smoking (n=21) and SHS (n=28) had worse mean scores in nasal endoscopy Lund-Kennedy scores, being 8.61 for active smokers and 8.07 for SHS, than cases without smoking exposure (n=51) being 7.30. CRS cases exposed to active smoking (n=21) and SHS (n=28) had worse mean scores in Lund-Mackay staging system on CT Scans, being 10.43 for active smokers and 9.37 for SHS, than cases without Smoking exposure (n=51) for which it was 7.67. Conclusion: Tobacco smoke exposure has been found to a significant risk factor for CRS. Cigarette smoke, either through active smoking or second hand smoke exposure contributes directly to CRS. Exposure to second hand smoking during childhood and adulthood is an established risk factor for CRS. SHS exposure should be included in the medical history of the patient as it represents an opportunity for otolaryngologists to advise their patients about avoiding SHS. Chronic rhinosinusitis (CRS) is an inflammation of the paranasal sinuses that typically lasts beyond eight weeks. It is caused by infections, allergies, and the presence of sinus polyps or deviated septum. Signs and symptoms include headache, nasal discharge, swelling in the face, dizziness, and breathing difficulties. It is a prevalent and costly disease that has affected quality of life of millions of individuals over the past few decades. Environmental factors such as inhaled pollutants like cigarette smoke have been found to play a significant role in diseases of the upper airway including chronic rhinosinusitis (CRS). Smoking and second hand tobacco (SHS) exposures are now an important risk factor for CRS. Smoking cessation has been shown to play an important role in the success of both medical and surgical treatments because tobacco products not only act as an irritant to mucosa and cilia function but also act as carcinogenic. The goals of medical management for chronic rhinosinusitis (CRS) are to decrease mucosal edema, improve sinus drainage, and remove any infections that may be present. This generally requires a combination therapy with intranasal or oral corticosteroids, antibiotics, and nasal irrigation. The role of bacteria in the pathogenesis of CRS still remains debatable. When medical therapy is unsuccessful,the patient is taken up for surgical evaluation. Patients with CRS should be assessed for multiple chronic conditions that would modify management like asthma, cystic fibrosis, immunodeficiency, ciliary dyskinesia etc. The overall expenditure for CRS has been recognized as a socioeconomic burden, and it includes not only the cost for the medical management of the disease, but also includes costs to the society and economy due to lack of productivity by the individuals affected by these ailments. The cases for the study were selected from the patients attending the ENT OPD with clinical evidence of chronic or recurring acute rhinosinusitis for more than three months non responsive to appropriate medical therapy. All the patients in the study group were subjected to detailed history of wide spectrum of presenting symptoms viz. facial pain, headache, nasal discharge (whether it is watery, mucoid, purulent or blood mixed), nasal obstruction (its duration, whether it is continuous or intermittent and whether it is associated with any external nasal deformity). 100 cases with a confirmed diagnosis of CRS who presented to our institute, were evaluated with anterior rhinoscopy, nasal endoscopy and plain radiography & CT scans of paranasal sinuses. A validated questionnaire was used to assess past and present active smoking and SHS. Nasal Endoscopy was done using Hopkins rod endoscopes (0º, 30º, 45º, 70º and 90º)–diameter 2.7 mm/4 mm, length 18 cm after administering a spray puff of Xylocaine with adrenaline (10 drops of adrenaline to 2 ml of Xylocaine). Computed Tomography of Paranasal sinuses was also done in these 100 patients. The Lund-Kennedy endoscopic scoring system was used, which quantifies the pathologic states of the nose and paranasal sinuses, focusing on the presence of polyps, discharge, edema, scarring, or adhesions and crusting. Lund- Kennedy scores range from 0 to 20. For example Polyps are graded as absent (0), present in the middle meatus (1), or present beyond the middle meatus (3) and likewise for other observations. The Lund-Mackay CT Scoring system was used for evaluation of CT Scans. The right or left sinuses were respectively divided into six portions, including maxillary sinus, anterior ethmoid sinuses, posterior ethmoid sinuses, sphenoid sinus, frontal sinus, and ostiomeatal complex. The severity of sinus mucosal inflammation or fluid accumulation was scored as 0 (complete lucency), 1 (partial lucency) or 2 (complete opacity). The ten scores for the various sinuses and bilateral ostiomeatal complexes were summed to give a bilaterally total LMS that could range from 0 (complete lucency of all sinuses) to 24 (complete opacity of all sinuses). The data from data collection forms were tabulated in a Microsoft Excel® spreadsheet. Data were then exported to SPSS, version 20.0 for statistical analysis. The level of agreement between CT and Endoscopy findings was determined by calculating kappa statistics; considering kappa coefficient: ≤ 0 poor, 0.01–0.20 slight, 0.21–0.40 fair, 0.41– 0.60 moderate, 0.61–0.80 substantial, and 0.81–1 almost perfect. Chi-square and Student’s t tests were used for statistical analyses. P value of < 0.05 was considered as statistically significant. In our study the various age groups affected in descending order are; group 21-30 (31%), group 10-20 (26%), group 31-40 (20%), group 41-50 (14.5%) and group above 50 (8.5%). Out of 100 patients; 53 were male and 47 were female. M:F ratio=1.12:1 (Figures 1 and 2). 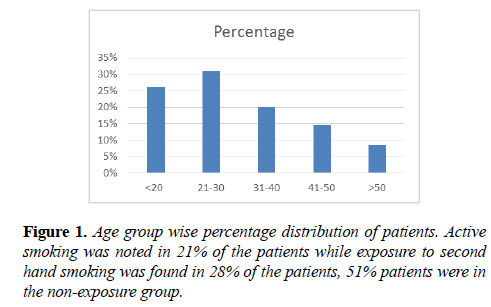 Figure 1: Age group wise percentage distribution of patients. Active smoking was noted in 21% of the patients while exposure to second hand smoking was found in 28% of the patients, 51% patients were in the non-exposure group. Figure 2: Figure showing distribution among active smokers, nonsmokers and second hand smokers. CRS cases exposed to Active smoking (n=21) and SHS (n=28) had worse mean scores in nasal endoscopy Lund-Kennedy scores, being 8.61 for active smokers and 8.07 for SHS, than cases without Smoking exposure (n=51) being 7.30. CRS cases exposed to Active smoking (n=21) and SHS (n=28) had worse mean scores in Lund-Mackay staging system on CT Scans, being 10.43 for active smokers and 9.37 for SHS, than cases without Smoking exposure (n=51) for which it was 7.67 (Figure 3). Figure 3: Figure showing distribution of nasal endoscopy Lund-Kennedy scores and Lund-Mackay staging system on CT Scans. This study revealed that there is a dose-response relationship found between chronic rhinosinusitis and the individuals that were susceptible to second hand smoke. Second hand smoke has also been shown to increase risk of various other respiratory ailments, lung cancer, and heart disease in non-smokers. The more places people reported being exposed to tobacco smoke, the higher their risk for chronic sinusitis. Second hand smoke exposure may increase susceptibility to or worsen respiratory infections, inhibit immune responses and increase the permeability of cells lining the respiratory tract. Reh et al. in their study found that cigarette smoke, either through active smoking or passive exposure contributes directly to CRS. Recent studies have also suggested that active smoking is not a contraindication to endoscopic sinus surgeries . A significant association between sinusitis and Second hand smoking was also found by Hur et al. .
Nieman et al. in their study found that despite the increasing evidence for passive smoke exposure as a risk factor for CRS, relatively few physicians inquire about SHS and give suggestions on SHS avoidance. They found that a brief physician inquiry increases the chances and success of smoking cessation. Including SHS exposure in the medical history of the patient represents an opportunity for otolaryngologists to advise their patients about avoiding SHS . In another study by Reh DD exposure to Second hand smoking during childhood and adulthood was found to be a risk factor for CRS. On comparison with unexposed CRS cases, SHS exposed cases were found to have worse nasal symptoms and used more systemic and topical decongestants compared with unexposed cases . Exposure to SHS is common and significantly associated with CRS. These findings were found to have important clinical and public health implications. Approximately 40.0% of CRS appeared to be attributable to SHS in a study by Tammemagi et al. .
Large population-based studies have been used to establish smoking as a significant risk factor for CRS. Ciliary dyskinesia, both primary and secondary, caused by smoke exposure affects both the sinonasal cavity and lower airways simultaneously both by decreasing the frequency of beating of cilia and also by inducing mucostasis. These effects may be reversible after cessation of smoking . Berania et al. found active tobacco smoking to be associated with increase in markers of systemic inflammation in patients with CRS. The proinflammatory effect of smoking seems not only to act locally on sinus mucosa but also influence levels of inflammatory biomarkers systemically . Tobacco smoke exposure was associated with increased prevalence of rhinitis symptoms, but decreased prevalence of allergic sensitization. This results of Shargorodsky et al. highlighted the complex relationship between tobacco smoke exposure and sinonasal pathology . There is also significant association between foetal exposure to maternal passive smoking and active smoking with childhood diseases like asthma and atopic illnesses as described by Lee et al. .
Lee et al. found significant association between active smoking and CRS. They found for each year of active smoking, CRS prevalence increased by 1.5% . Thus, there is already ample reason for taking action to eliminate exposure to second hand smoke. The basis of our findings, physicians should recommend that patients who are susceptible to chronic rhinosinusitis or who have chronic rhinosinusitis avoid exposure to second hand smoke. Cigarette smoke, either through active smoking or second hand smoke exposure contributes directly to CRS. SHS exposure should be included in the medical history of the patient as it represents an opportunity for otolaryngologists to advise their patients about avoiding SHS. Exposure to second hand smoking during childhood and adulthood is an established risk factor for CRS. Ciliary dyskinesia, both primary and secondary, caused by smoke exposure affects both the sinonasal cavity and lower airways. Active tobacco smoking is also associated with increase in markers of systemic inflammation in patients with CRS. Foetal exposure to maternal passive smoking and active smoking is found to be associated with childhood diseases like asthma and atopy. Reh DD, Higgins TS, Smith TL. Impact of tobacco smoke on chronic rhinosinusitis: a review of the literature. Int Forum Allergy Rhinol. 2012;2:362-9. Hur K, Liang J, Lin SY. The role of secondhand smoke in sinusitis: a systematic review. Int Forum Allergy Rhinol. 2014;4:22-8. Nieman CL, Navas-Acien A, Lin SY, et al. Physician screening and recommendations on secondhand smoke in chronic rhinosinusitis patients. Int Forum Allergy Rhinol. 2014;4:117-23. Reh DD, Lin SY, Clipp SL, et al. Secondhand tobacco smoke exposure and chronic rhinosinusitis: a population-based case-control study. Am J Rhinol Allergy. 2009;23(6):562-7. Tammemagi CM, Davis RM, Benninger MS, et al. Secondhand smoke as a potential cause of chronic rhinosinusitis: a case-control study. Arch Otolaryngol Head Neck Surg. 2010;136:327-34. Tint D, Kubala S, Toskala E. Risk Factors and Comorbidities in Chronic Rhinosinusitis. Curr Allergy Asthma Rep. 2016;16:16. Berania I, Endam LM, Filali-Mouhim A, et al. Active smoking status in chronic rhinosinusitis is associated with higher serum markers of inflammation and lower serum eosinophilia. Int Forum Allergy Rhinol. 2014;4:347-52. Shargorodsky J, Garcia-Esquinas E, Navas-Acien A, et al. Allergic sensitization, rhinitis, and tobacco smoke exposure in U.S. children and adolescents. Int Forum Allergy Rhinol. 2015;5:471-6. Lee SL, Lam TH, Leung TH, et al. Foetal exposure to maternal passive smoking is associated with childhood asthma, allergic rhinitis, and eczema. Scientific World Journal. 2012;2012:542983. Lee WH, Hong SN, Kim HJ, et al. Effects of cigarette smoking on rhinologic diseases: Korean National Health and Nutrition Examination Survey 2008-2011. Int Forum Allergy Rhinol. 2015;5:937-43.